This turn had 44 games played across the 8 campaign battle locations. You can see the details for all of the turn 4 battles here. 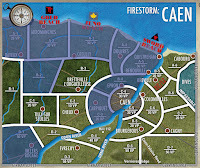 You can see all of the Firestorm Caen blog posts by clicking on this link. A group in Montreal played a unique 11 player giant battle as part of this turn's games. We've had more contributions from around the world this turn. Pictures in this blog posts are from the players credited in the captions. Some players won multiple victories this turn. When listing the top generals for each location, I have chosen the top general from each side who has not yet been mentioned in the turn's results (unless there was no other option). The campaign map at the start of the turn. Allied troops on Juno Beach were finally able to link up with the beleaguered forces at Sword Beach this turn. After 4 turns, the Allied forces finally secured the land at Douvres and were able to resupply the forces at Sword Beach. The top Allied general was Rich B and the top German general was Luke P. No Firestorm Troops were harmed in the taking of this location. After holding Epron for weeks, the 21st Beute Stug and III Flak Division forces at Epron were overwhelmed and destroyed. The German forces also managed to destroy the 9 AGRA artillery forces used in the attack. The location resulted in a draw that was decided to be a victory for the Allied forces. The top Allied general was Scott S. and the top German general was Scott M.
A picture of Alex's game by Glen T. How many points for the iPad support option? AT 16, FP 3+? 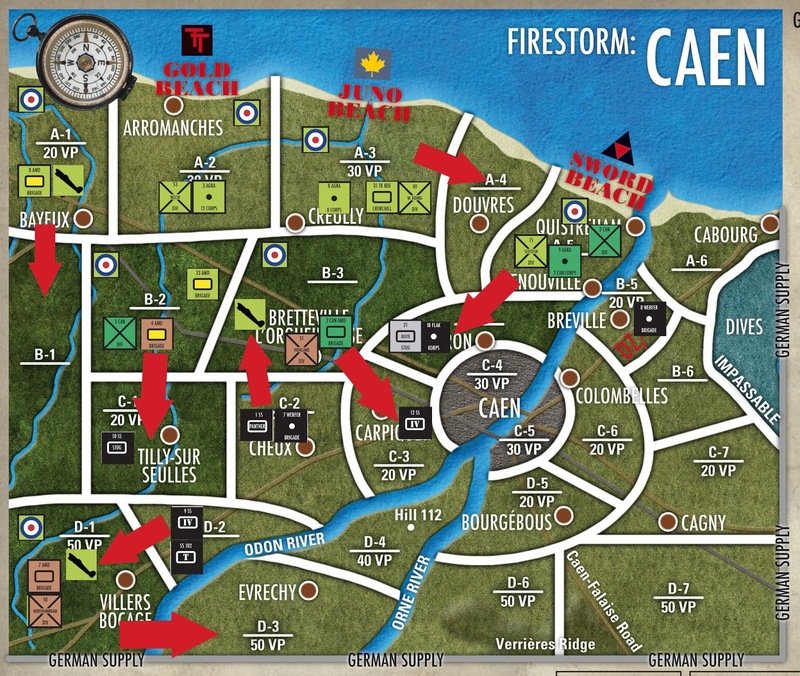 The Allied forces forced a breakthrough on the outskirts of Caen with their 37-33 victory at Carpiquet. The Allied forces were lead by Mike H. and Rich B, while the Axis forces were lead by Uber-general Morgan "5+ save". The Allies captured Carpiquet and pushed the 12 SS. Panzer Division back into Caen. Dejan M with a nice little city table. Allied forces attacked into Tilly Sur-Seulles in an attempt to relieve the surrounded 7th Armoured Division in Villers Bocage. Unfortunately for the valiant 7th AD, the Allied attack failed and the forces were pushed back into B-2. The top Allied general was Scott S. (again). The top German general was Scott M. (again). Total victory points were 17-11 for the Germans. The Axis forces pulled out a 27-22 victory at Evrechy. At 50 campaign victory points, this was a critical victory for the German forces in the area. The German forces were lead by Aaron F. and Stephen B. The top Allied general was the Hawaiian tanker, George K. The mega-battle in Montreal saw the German forces prevail in that location. Allied forces a Bayeux launched another relief effort into B-1 to attempt to aid the forces surrounded at Villers Bocage. Unfortunately, the Axis forces in the area had other plans. Lead by German aces Scott M. and Morgan L, the German forces maintained control of the sector with a 24-18 victory. The top Allied generals were Sierra T. and Sander T.
Morgan L. shows the Germans how to win. Just make your opponent roll like this :-P.
Outnumbered, out of supply, tired, battle weary and exhausted, the infamous Desert Rats managed to hold on to Villers Bocage. Only a shell of a town remains after furious tank battles through the streets of this ancient town. Despite long odds, the Allied forces managed to secure a 32-23 victory thanks to the work of Captain Stefan G. and the support of the mass battle fought in Montreal. The top Axis general was Morgan L. As a result of the battle, the 102 SS Schwere Panzer Division was destroyed and sent back to Germany for refitting. Another photo from Morgan L.
A picture of the mega-battle table by Ernst-Udo P. and the players in Montreal. Their battle fought the path between Villers Bocage and Evrechy. German forces at Cheux counterattacked into Bretteville to recapture the ground lost during Operation Epsom. The German forces managed to secure a 8-6 victory thanks to the work of Stephen B. The top Allied general was Scott S. The 7 Werfer Brigade was destroyed in the attack. A graph of the results at each location. In summary, the Allies managed to capture Douvres, Carpiquet and Epron this turn while losing Bretteville to the German forces. The Allied forces held a 157-150 edge in total victory points over the 44 games. The German forces lost 4 Firestorm troops while the Allies lost 1. 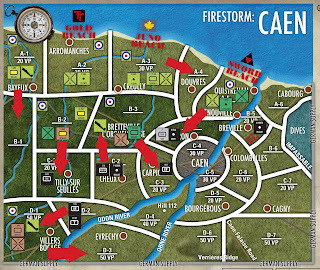 With the victories, the Allied forces can now threaten Caen from Carpiquet and Caen. 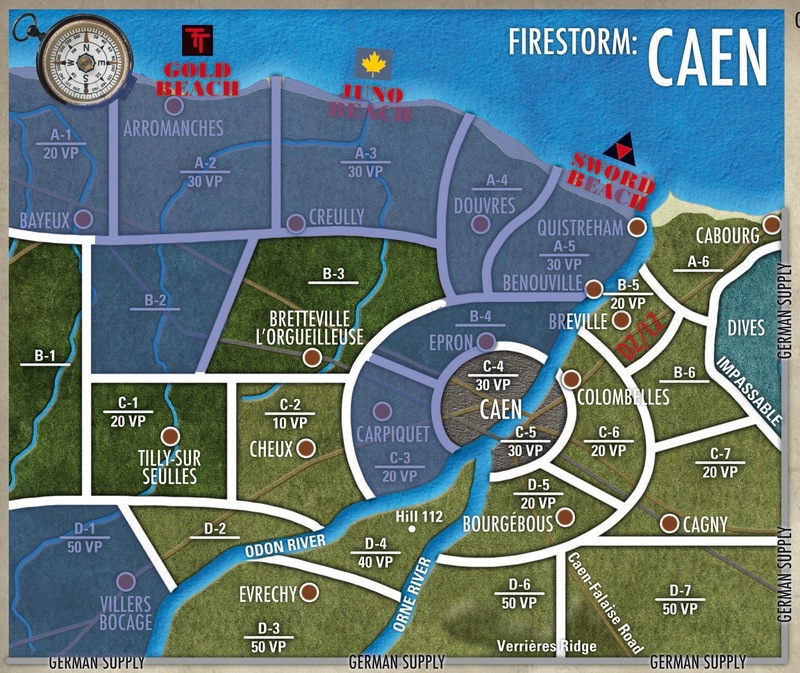 Check back later this week for the full details of the Turn 5 battles and the conclusion of the Firestorm: Caen campaign! Post any links to AARs or other reports in the comments below. I imagine we should have some bloody battles around Caen :-). Yay! I love the way this is playing out: thanks for all your work Cameron! Glad you are enjoying it Drax. Hopefully you can get another game in this round. I feel your pain! There is lots of time for turn 5!